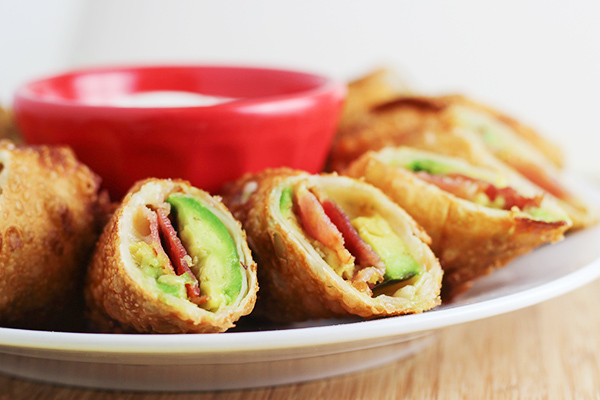 This Easy Avocado Bacon Egg Rolls recipe is insanely delicious and incredibly easy. 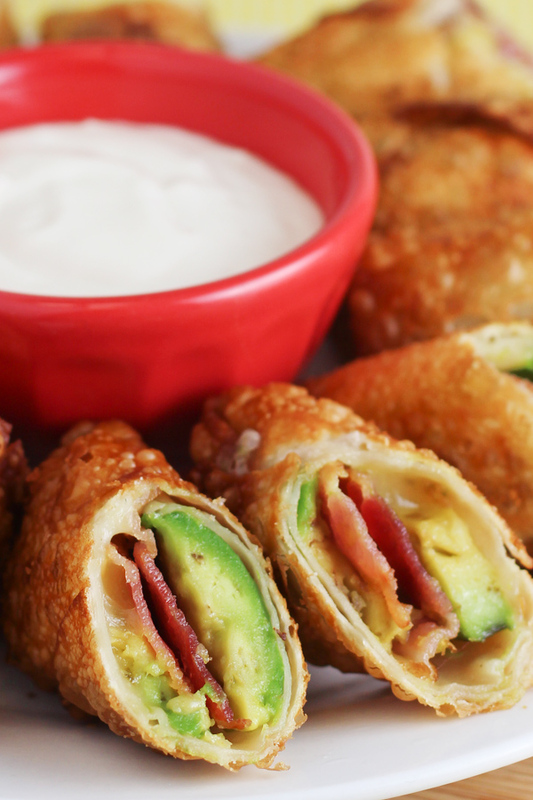 Avocado slices, bacon, and pepper jack cheese are rolled up in egg roll wrappers and then fried to make this ultimate party food. Avocados are one of my most favorite foods, so I look for any excuse to enjoy them. 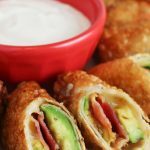 This Easy Avocado Bacon Egg Rolls recipe is great for parties, but beware: they are addictive and no matter how many I make, they are always gone in a flash. 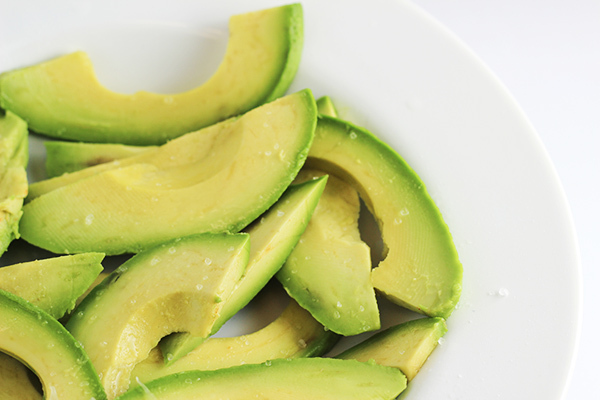 The ingredients are very simple: perfectly ripe avocado slices are drizzled with lime and then sprinkle with salt. I would happily eat this whole bowl before assembling my egg rolls, but I do my best to show restraint. 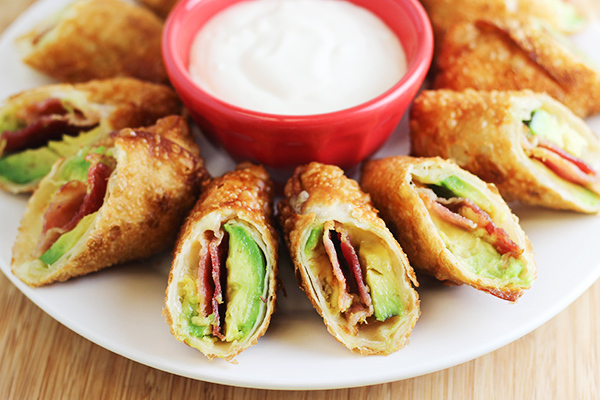 For each egg roll, you create a stack of avocado slices, bacon, and pepper jack cheese on an egg roll wrapper. 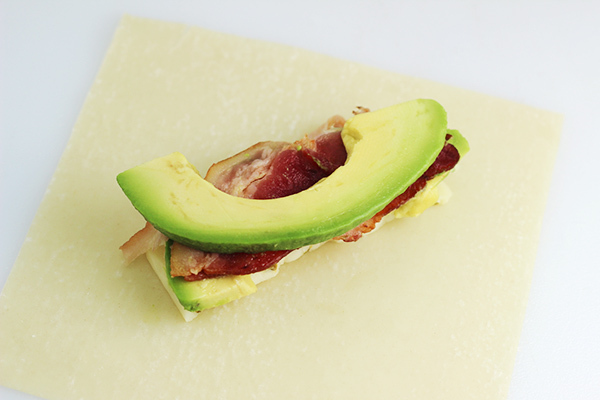 There is really no right or wrong way, but my method is a 1/2 slice of pepper jack cheese (from the grocery deli, usually), an avocado slice, then 1/2 slice of bacon, and finally topped with another avocado slice. The egg roll is rolled up nice and tight, sealed with a flour/water mixture, and fried until golden brown. I don’t recommend making these too far in advance. I generally create them just before the party and then cut them in half right before serving. You can also serve them whole if you wish. I haven’t yet experimented with freezing them. I think these Easy Avocado Bacon Egg Rolls are delicious enough without a dip, but I have certain family members who believe it’s a crime to enjoy things like this without a dip. I will admit that it does make a more impressive presentation. Some dip ideas are: salsa, ranch dressing, chipotle ranch dip, sweet Thai chili sauce…but I’d love to hear your ideas. How would you dip these? 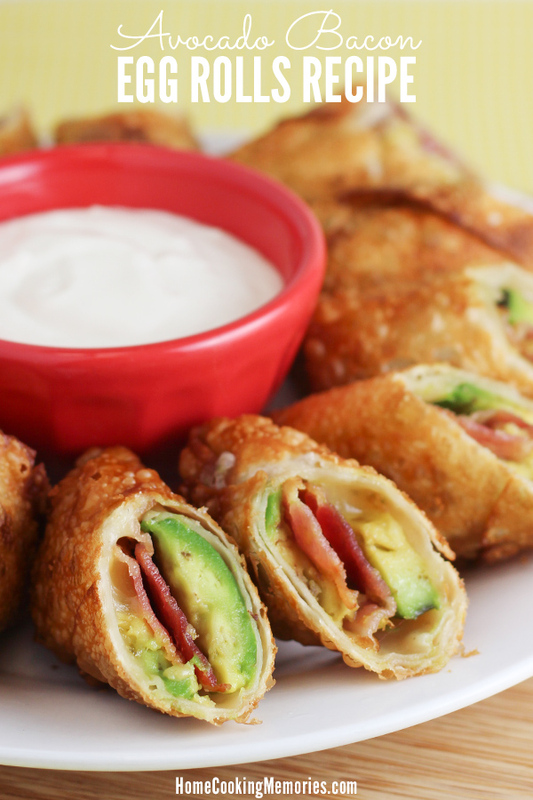 Ready to make these delicious little bundles of goodness? Here’s the complete recipe, ready for you to print. If you aren’t ready for it yet, be sure to save to one of your Pinterest boards. Heat about 2″ of oil to 350 degrees F in a large frying pan. Place avocado slices on a place or large bowl. Drizzle with lime and then sprinkle with salt as desired. Place flour in a small bowl and add water to make into a watery/thin paste. Place one egg roll wrapper on your work surface, with one corner pointing towards you, forming a diamond on your surface. Lay 1/2 of a slice of cheese in the middle. 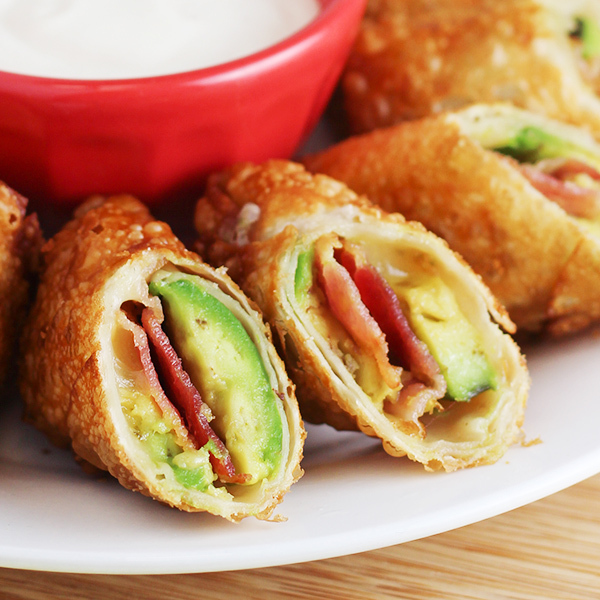 Lay 1 slice of avocado on top of cheese, and then one slice of bacon, broken in half. Finish with another slice of avocado. Fold the part of the wrapper pointing towards you over the stack of avocado, etc. 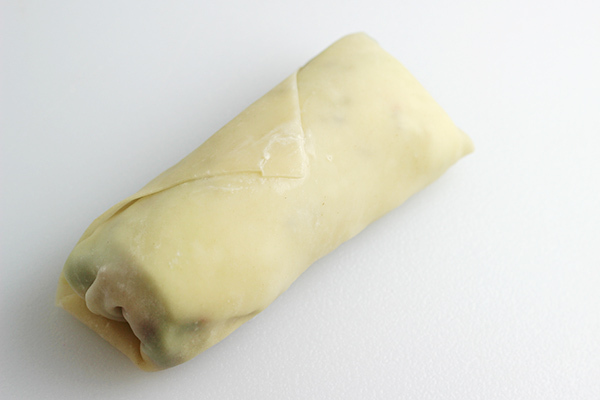 Fold the left and right points over the middle and roll up egg roll nearly all the way, taking care to fold tightly with no openings for ingredients to fall or leak out. With finger tip, dab a bit of the flour mixture on the remaining corner at the top and then seal this corner onto the egg roll to close it. Repeat steps with remaining ingredients. Carefully place a few egg rolls into hot oil and cook until golden brown, turning them over once during the frying. Remove from oil and allow to drain and cool on a place lined with paper towels or napkins. Serve whole or cut in half at an angle with dip of your choice (if you wish). Please can you tell me what egg wraps are as lve not heard of them in England, can l make them my self please. For dip: Chipotle Ranch, no question. I shouldn’t be looking at these as I’ve just started my healthy eating regime. Luckily I don’t have a kitchen to whip up a batch (that’s normal here in Taiwan). Or access to avocados. LOL…I hear ya, Tom! They can be dangerous, but good in moderation. Have you tried oven frying these? I imagine it would work; and wonder if your love of avo’s brought you there? I haven’t tried oven baking them yet, but I would imagine it would work. Thanks for coming by and commenting, Joy! What I do for things that require frying is I put oil on a cookie sheet more than just greased, but less that 2″, and bake (with nothing on it) for 10-15 minutes. You should hear the oil popping a little. CAREFULLY take the cookie sheet out of the oven and place items on it. You will need to flip items a couple of times so each side gets baked/fried. Yes there is still oil and you are still frying a little.. but it is way better than letting it swim in the oil vat. Sounds like a great option, Allison! Thanks for sharing your method.